They came one cold December day. Not fearless warriors but fearsome hoardes hell-bent on destruction of the genocidal kind that leaves no room for regeneration. That was one year ago in Gaza. The attack shocked a complacent world into finally seeing Israel’s merciless ferocity against the Palestinians already hounded, herded and imprisoned in compounds throughout their land, if not actually driven out. More than sixty years of Western devotion to Israel’s security was blown wide open as truth shattered spin in three weeks of carnage and devastation. Dead bodies do not lie and neither do the maimed and the disfigured. Thousands have been left to make sense of the horrors they saw and the hollow aftermath to which they have been abandoned. Landscapes of rubble as far as the eye can see are still testament to the homes once standing in villages and towns, the homeless now huddled in tents while they wait one year on for materials to re-build. Little food, contaminated water, rationed fuel and electricity and the barest of medical supplies are just more of many cruel and wanton deprivations pushing Palestinian society to the limits of endurance. This is Gaza: a population of 1.5 million people kept in formaldehyde by Israel’s crippling siege. It is a human catastrophe that has many enablers. World leaders have shut their eyes to the crimes witnessed and documented countless times over by human rights groups. World media continuously sidesteps the truth and deliberately ignores international efforts to highlight the humanitarian crisis. Together they are complicit in Israel’s dehumanisation of a people. We are also complicit if we remain silent and do nothing. It is not enough to know and empathise. Change can only come from people being engaged – learning, thinking, communicating, and being prepared to act. Almost 2000 internationals have taken action. Some 200 are in Jordan after a three-week trek through Europe in the Viva Palestina convoy of trucks filled with humanitarian aid while another 300 joined them from Greece, Turkey and Jordan; and then, there are the 1400 who have landed in Egypt from all over the world for the scheduled Gaza Freedom March on 31 December. Neither group has been given clearance to enter Gaza. This is where the rest of us who were unable to join these brave souls can bring some power to bear. There simply is no time to waste. Letters, faxes, emails must be written to governments, embassies and media outlets. Not one letter, not one time, but a constant stream. We have to urge friends and families to write as well. We have to urge governments to put pressure on Egypt to open the Rafah crossing and pressure on Israel to lift the siege. We have to hound the media like they hound us when they sniff a story. 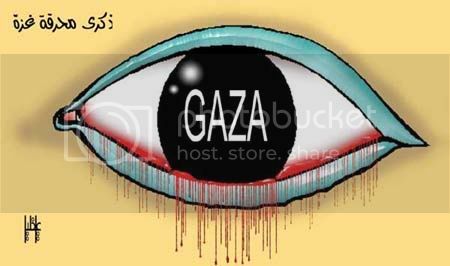 And Gaza is a story that needs to be told. The marchers and the convoy bringing aid to a besieged Gaza are only a part of that story. The real story is Israel’s ethnic cleansing of the Palestinians from their homeland. Israel must be held to account because it is the instigator of all this misery. Israel has acted with impunity for far too long. It is a bully in world affairs and our leaders and media are all shamefully intimidated. Only people coming together collectively can change that dynamic – and we must come together, before we too become craven hostages to Israel’s criminal enterprise. Standing up for Palestinian human rights is not anti-Semitic because the Palestinians are also a Semitic people. Nor is it anti-Israel, but rather a protest against Israel’s Zionist policies and practices designed to permanently fragment and dissipate Palestinian society. So brutal is its Zionist agenda and so contrary to Judaic teachings that many Jews are already speaking out in shame at what is being done in their name. As decent and honourable citizens of the world, we too need to speak out in shame at what we have allowed to occur for far too long. Terrible crimes have been committed and some predict that even more terrible ones are to come. The reality is that all along we have been witnessing a slow genocide and we have allowed guilt, pragmatism and self-interest to stand in the way of our common humanity. The world needs to say “enough” and refuse to indulge Israel’s Zionist leaders and advocates whose free ride has taken them to the heady heights of arrogance. That universal effort needs to begin before the bitter winter freezes any kind of hope in Gaza and it needs to be sustained for as long as it takes to free all of Palestine. Anything less, will hasten a 21st century genocide.